X-Men are the team of super heroes from the Marvel Movies. Playtech has brought these super heroes to the reels. The X-Men are recruits of Professor Xavier and are so called because they possess the X-Gene that gives them super powers. 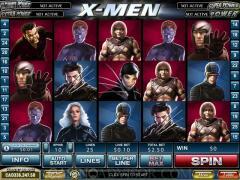 In this slot game the X-Men are Professor Xavier, Wolverine, Nightcrawler, Storm and Cyclops. The X-Men are generally battling the super villains of the Brotherhood of Mutants led by Magneto. The other super villains are Rogue, Mystique, Sabretooth and Juggernaut. WILD is the wild symbol and the X-Men Logo is the scatter symbol. 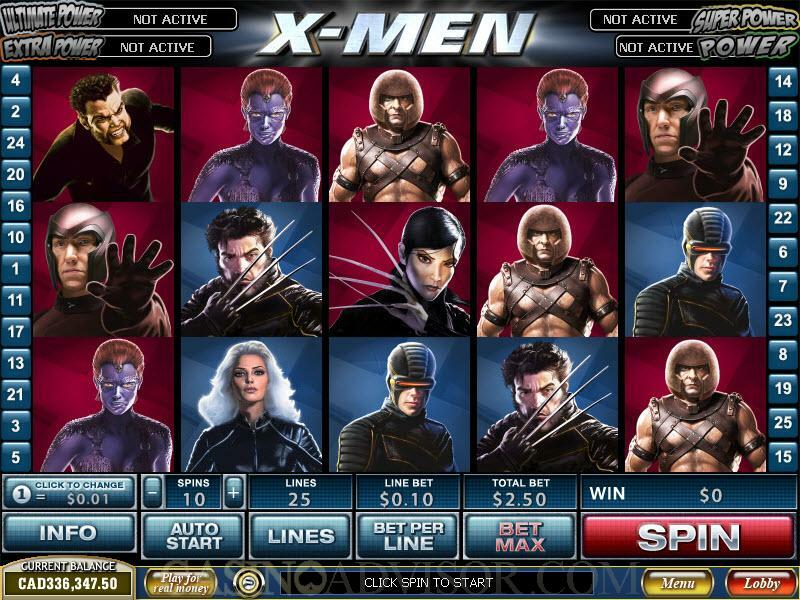 X-Men is a 25 payline video slot. Players can wager up to 10 coins per payline. There are 8 coin denominations to choose from, which range from 0.01 to 5.00. Most of these are 1.00 or less giving greater flexibility to low rollers. X-Men has two game features, one of which is extremely simple and the other extremely complex. The simple feature is called the X Feature. It comes to play when only super heroes occupy the 5 positions on Reels 2, 3 and 4 that form an X. The feature immediately pays 5 times the total bet. The feature is available in the normal spins only. The Free Games feature is triggered when three or more scatter symbols appear on the reels. This game has two modes, the Heroes mode and the Villains mode, and it toggles between the two modes. 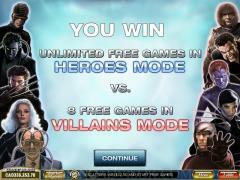 The Heroes mode has unlimited number of spins and the Villains mode has 8 free spins. The game begins in the Heroes mode. Normally only the super heroes and the wild symbol appear in this mode. Magneto appears as an extra wild symbol. If Magneto appears on Reel 3 then the game switches to the Villains mode. Normally only the super villains and the wild symbol appear in this mode. Xavier appears as an extra wild symbol. If Xavier appears on Reel 3 then the game switches to the Heroes mode. Every time the game switches to the Villain mode the count starts from the previous number. 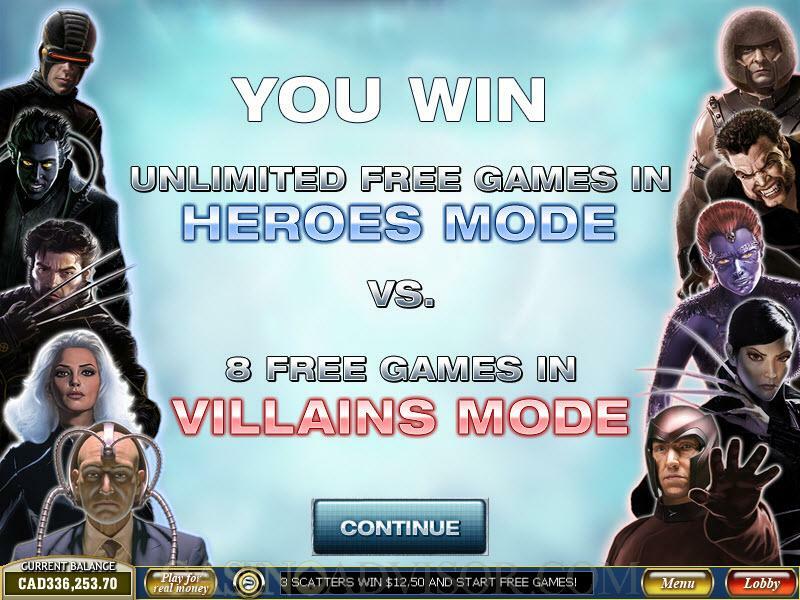 Once 8 spins are over in the Villains mode the Free Games feature ends. X-Men is linked to the four level Marvel Mystery Jackpot. The jackpot is randomly triggered but has greater chances of being triggered at larger wagers. There is a grid of 20 squares that conceal the symbols for the various jackpot levels. The players click on the squares to reveal the symbols. The jackpot level that is the first to reveal three symbols is hit. Interested in reading more detailed information about X-Men? If so Click Here for more details.